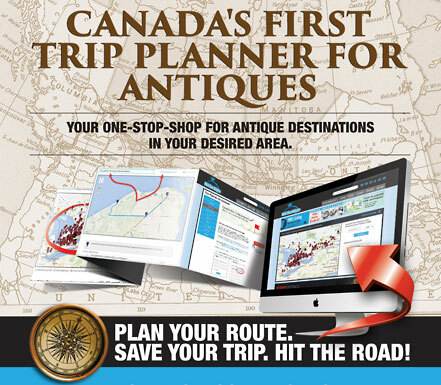 WorldClassAntiques.com, the largest directory of antiques dealers in Canada, today announced the launch of Canada’s first trip planner, exclusively built for antique collectors. Powered by leading integrated marketing and technology solutions company Single Entry Point, the web-based trip planner is available for free at WorldClassAntiques.com/TripPlanner. "Taking a drive to find really great antiques is what makes the experience so special and memorable for so many collectors," stated Mike Lascut, president of Single Entry Point. "But we think a little planning can go a long way to help antique collectors shop smarter. Our trip planner puts a modern twist on antique collecting." With the new trip planner, collectors can view nearby locations, explore dealers and markets using the map tool, select the ones they’d like to visit, and even save routes for future outings. Users can also name their trip, choose whether to take the highway or avoid tolls, and make notes for future reference. The trip planner includes listings from World Class Antiques, the largest searchable directory of antique dealers in Canada. Online at WorldClassAntiques.com, the website connects antique dealers with collectors and those looking to discover antiques. "It doesn’t take a lot to plan an outing, but with our trip planner, antique collectors will waste less time driving around aimlessly, trying to find quality antique dealers" notes Lascut. "We’re thrilled to be able to bring this technology to collectors for no charge at all." Antique dealers can create a free account online at WorldClassAntiques.com and start being part of the trip planner database beginning today. Antique dealers who aren’t listed can add their location for free and gain worldwide visibility immediately. Single Entry Point is an online marketing and technology consultancy devoted to giving large, medium and small companies an extreme edge through web development, search marketing, email marketing and web analytics. With 15 years of technology experience under its belt, the company continues to catch the attention of North America’s biggest companies thanks to its unique blend of expertise, technology, and intelligent application of data, all of which have proven to give its clients an unfair advantage and the prospect of unmatched market share. Great collectible piece, new old stock (NOS). Made in Western Germany circa 1960-1970. Sweepstakes begin on April 1st at 12:00 a.m. EDT and close on April 30th at 11:59 p.m. EDT. Enter either on the World Class Antiques website or on Facebook.com/WorldClassAntiques. Toronto, Canada – November 6, 2013 – Antique collectors no longer have to resort to Sunday drives and online classified ads to find what they’re looking for. Leading integrated marketing and technology solutions company, Single Entry Point, today announced the launch of World Class Antiques, the largest searchable directory of antique dealers in Canada. Online at WorldClassAntiques.com, the website connects antique dealers with collectors and those looking to discover antiques. "We’re offering every antique dealer in Canada an online presence and a smart way to connect with collectors for free," stated Mike Lascut, president of Single Entry Point. "We recognize that a lot of antique collectors live a digital life, so we’re excited to modernize the antique collecting experience for Canadians." Antique dealers can take advantage of a free membership, which gives them a free listing on the site, a homepage marker on Google Maps, a Get Directions link, a dedicated store page, SEO-friendly URLs, mobile-friend web pages, and more. For $99 per year, antique dealers can upgrade to Premium, which gives them multiple listings, a Premium badge to help build credibility, and a gallery to display products. There is no cost for collectors to use the website to explore antique dealers and no account is required. What’s more, the website is optimized to work on smartphones, so antique collectors who happen to be out for a drive can find an antique store, dealer, or show in the neighbourhood. For antique collectors, World Class Antiques is more than just a directory of locations. It’s a community, a forum for discussions, and a place to find events. For dealers, it’s a smart new way to drive traffic to their location. An antiques website from a modern marketing and technology company might seem like a bit of an odd pairing at first glance, but Lascut notes that the match makes perfect sense. "We already provide web development and search engine marketing expertise to a large variety of industries," commented Lascut, "With WorldClassAntiques.com we’re able to leverage our expertise, bring everything together, and help more antique dealers connect with more buyers—effortlessly." Antique dealers can create a free account online at WorldClassAntiques.com and start connecting with collectors today. Now available through our Video Production service. Curious what a Premium Listing really looks like? Check out our own World Class Antiques Premium Listing, featuring embedded profiles from Facebook, Pinterest, and Google Maps, and a selection of antique books, maps, vintage toys, and antique weapons from our own collection. What are the differences between the FREE and Premium listings?